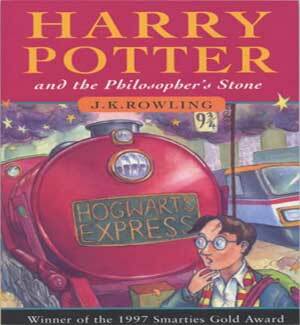 Hailed by critics as one of the best childrens' books of all time, JK Rowling's Harry Potter and the Philosopher's Stone is also one of the most popular. A simple idea conceived on a train ride in 1990 has now blossomed into a complex, seven-part tale that has entertained audiences around the world and become an icon of our popular culture. Rowling told of how she came up with the idea for the Harry Potter books in an interview with the BBC: "I was going by train from Manchester to London, sitting there thinking of nothing to do with writing, and the idea came out of nowhere. I could see Harry very clearly - this scrawny little boy. And it was the most physical rush of excitement. I'd never felt that excited about anything to do with writing, I'd never had an idea that gave me such a physical response. So I'm rummaging through this bag to try to find a pen or pencil or anything. I didn't even have an eyeliner on me, so I just had to sit and think. And for four hours, because the train was delayed, I had all these ideas bubbling up through my head." She writes on her official website, "I began to write 'Philosopher's Stone' that very evening, although those first few pages bear no resemblance at all to anything in the finished book. I moved up to Manchester, taking the swelling manuscript with me, which was now growing in all sorts of strange directions, and including ideas for the rest of Harry's career at Hogwarts, not just his first year." Over the next few years, Rowling wrote when she found time. She moved to Edinburgh with Jessica in late 1994, at which point she writes: "I intended to start teaching again and knew that unless I finished the book very soon, I might never finish it; I knew that full-time teaching, with all the marking and lesson planning, let alone with a small daughter to care for single-handedly, would leave me with absolutely no spare time at all. And so I set to work in a kind of frenzy, determined to finish the book and at least try and get it published. Whenever Jessica fell asleep in her pushchair I would dash to the nearest cafe and write like mad. I wrote nearly every evening. Then I had to type the whole thing out myself. Sometimes I actually hated the book, even while I loved it." In a June 1997 interview with The Herald, she said, "This book saved my sanity. Apart from my sister I knew nobody. I've never been more broke and the little I had saved went on baby gear. In the wake of my marriage, having worked all my life, I was suddenly an unemployed single parent in a grotty little flat. The manuscript was the only thing I had going for me." "It was the best letter of my life, I read it eight times. Later on [the spring of 1997] Christopher rang and said there was an auction going on in America. He said I should get ready because a Mr Arthur Levine of the Scholastic Press would pay a six-figure sum and would be ringing me in 10 minutes. I nearly died." In August of 1996, Bloomsbury Press purchased the rights to publish Harry Potter and the Philosopher's Stone, as it is titled in the UK. Scholastic then bought the rights to publish it in the US (under the title of Harry Potter and the Sorcerer's Stone) for more than $100,000 in the spring of 1997. Both the hardcover and paperback editions of Harry Potter and the Philosopher's Stone were published in the UK on June 26, 1997. 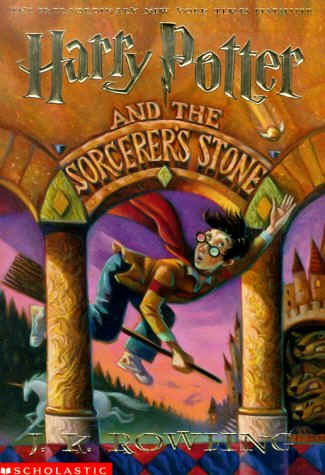 The Americanized hardback version of the book, Harry Potter and the Sorcerer's Stone, was published by Scholastic on September 1, 1998 (ironically, the same date as the start of term in each book). Scholastic then released the paperback edition of Sorcerer's Stone on September 8, 1999 and the large print edition on November 1, 1999. The book experienced immense success in the United States, and within two months Scholastic had completed their third print run of the book. JK Rowling toured across the United States (she hit Denver, New York, San Francisco, Chicago and Seattle) following the release of Sorcerer's Stone, and the level of excitement amazed her. She said, "It was fantastic, the best experience of my life and if I could do it all again tomorrow, I would....Perhaps it was stupid of me to think American kids would be any different to Scottish children, but their reaction was very similar. When I did public readings, they even all laughed in the same places as British youngsters." The story opens with the unrestrained celebration of a normally-secretive wizarding world which for the past eleven years has been terrorised by Lord Voldemort. The previous night, Voldemort discovered the refuge of the hidden Potter family, and killed Lily and James Potter. However, when he turned his wand against their infant son, Harry, his killing curse rebounded upon him. Harry, meanwhile, is left with a distinctive lightning bolt scar on his forehead, the only physical sign of Voldemort's curse. Harry's mysterious defeat of Voldemort results in him being dubbed "The Boy Who Lived" by the wizarding world. The orphaned Harry is left with, and subsequently raised by his cruel, Muggle (non-magical) relatives, the Dursleys who, in attempt to rid him of his magical powers, hides his magical heritage and gives him severe punishments after several strange occurrences. Shortly before Harry's eleventh birthday, owls begin delivering letters to the Dursley house. Denying Harry access to them, but unable to stop the deliveries, Uncle Vernon moves the family to a small, deserted island where Rubeus Hagrid finds them. Confronting the Dursleys about their dishonesties with Harry, he hand-delivers the letter which invites him to study magic at Hogwarts School of Witchcraft and Wizardry. When Uncle Vernon continually tells Hagrid he's not going and foolishly insults Dumbledore, "I AM NOT PAYING FOR SOME CRACKPOT OLD FOOL TO TEACH HIM MAGIC TRICKS," Hagrid flies into a rage and does magic on Dudley, giving him a pig's tail when he "meant ter turn him into a pig." Harry finds out Hagrid is not allowed to use magic, as he once went to Hogwarts, but was expelled in his third year. That morning, Hagrid and Harry go to The Leaky Cauldron pub, where Harry finds out he is famous, "Welcome back, Mr Potter, welcome back," He realizes that he has not been told how to get to the platform and panicking, Harry tries to ask for directions, but the Muggles think he is taking too much time. When he hears a witch mother say, "-packed with Muggles, of course-" he asks her for directions. The mother tells him, "All you have to do is walk straight at the barrier between platforms nine and ten. Don't stop don't be scared you'll crash into it, that's very important. Best do it at a run if you're nervous." Eventually, when they get on the train, Harry befriends the sons of the woman, Molly Weasley, including his now - best friend Ron Weasley - the youngest son of the Weasley family, who are very poor but very kind. Ron is impressed by Harry's scar but unintimidated by his reputation. Harry also meets Hermione Granger, a muggle-born witch who is a bit of a bossy, insufferable know-it-all. Upon arriving at Hogwarts, all new students are sorted into one of the four school Houses by the Sorting Hat. Each House has specific characteristics: Slytherin is filled with ambitious, cunning people who may use any means to get what they want; Ravenclaw is home to those with sharp minds that value intelligence and wit; Gryffindor houses those who are daring and brave; and Hufflepuff is characterised by fairness, honesty and hard work. While Harry is being sorted, the sorting hat thinks Harry difficult to place and considers placing him in Slytherin. Harry wishes hard to not be in Slytherin and, hearing his thoughts, the hat places him in Gryffindor, along with Ron and Hermione. The arrogant Draco Malfoy, who by now is openly contemptuous of Harry and his friends, is sorted into Slytherin even before the hat can touch his head. During Harry's first broomstick flying lesson, Professor McGonagall spots Harry catching Neville Longbottom's stolen Remembrall from Draco and is drafted into Gryffindor's Quidditch team, becoming the youngest Seeker in a hundred years. He is given a Nimbus Two Thousand by Professor McGonagall, then the best broom. After landing, Draco challenges Harry to a Wizard's Duel, at midnight, in the trophy room. That night, Harry, Ron, Hermione (who couldn't get back into Gryffindor Common Room as the Fat Lady had gone visiting), and Neville (who could not remember the password) went to the trophy room searching for Draco, instead finding that he had set them up and had sent Argus Filch, the school janitor. Trying to find a place to hide, they accidently stumble across the door to the forbidden corridor. A three-headed dog, christened Fluffy by Hagrid, guards a trapdoor. They are saved by Peeves who, in a sing song voice says nothing to Filch about seeing them. Harry and Ron initially dislike the bossy Hermione. After a Halloween class involving Wingardium Leviosa, a hard-to-pronounce charm that makes objects fly, Ron insults her, and she retreats to the girls' bathroom crying after she overhears him. During the Halloween banquet, Quirrel informs everyone that a troll has entered the castle; Harry and Ron, the latter reluctantly, go to warn her, suspecting Snape is the culprit. By locking the troll in the nearest room, they realize that they have accidentally locked it in the girls' bathroom. They re-enter and fight it to save Hermione. Harry and Ron magically knock it out with its own club, ironically with Wingardium Leviosa (in the movie, Hermione desperately and hurriedly teaches the spell to them before she can be attacked). When the professors arrive on the scene, Hermione claims it was her fault, preventing the boys from getting into trouble. The three then become best friends. At Harry's first Quidditch match, Harry's broom becomes possessed, knocking him off and holding on for his life. Hermione see Snape staring at Harry and mouthing words, making her believe that it is Snape who is making his broom do weird things. Hermione lights Snape cape on fire, which stops the broom's possession allowing him to win the match. At Christmas, Harry receives an Invisibility Cloak, which once belonged to his father. Using it to explore the Restricted Section in the library to research information on Nicolas Flamel, a name Hagrid lets slip when they confront her about Fluffy. Harry is almost caught by Filch, when a book gives out a scream and Harry's lantern is broken. Seeing a door ajar, he slips through and discovers the Mirror of Erised, which shows him surrounded by his long-gone parents and family. He takes Ron to it the following night, but Ron sees himself as Head Boy and Quidditch Captain. Dumbledore later advises Harry, who returns once more, to no longer seek out the mirror, which will be moved, because it only shows what one desires, not what is real. After Christmas, Harry finds Nicolas Flamel's name on the back of Albus Dumbledore's Chocolate Frog card which gives Hermione an idea. She flips through a book she had taken out for a "little bit of light reading...Nicolas Flamel is the only known maker of the Philosopher's Stone, which produces the Elixir of Life, and will make the drinker immortal." After Harry's second Quidditch match, Harry sees Snape trying to get information from Quirrel about getting past "that beast of Hagrid's." Quirrel says he doesn't know what's he's talking about and they each go their separate ways. After seeing Snape's bitten leg at Halloween, the possession of Harry's broom, and the conversation with Professor Quirrel; Harry, Ron, and Hermione come to the conclusion that Severus Snape, the sinister Potions master and Head of Slytherin House, is trying to steal it in order to restore Lord Voldemort to power, but Hagrid denies it. Soon, Hagrid wins a Norwegian Ridgeback dragon egg in a card game with a hooded stranger in Hogsmeade. However, as dragon breeding is illegal, he can't keep Norbert. Malfoy sees Norbert before he can be released and ensures that they are caught by Professor McGonagall for being out of bed after hours, and gives all, including Draco, detention. Neville, who was trying to find Harry and Hermione, is also given detention. Gryffindor loses 150 points, and Harry, Hermione, and Neville are given the cold shoulder by their fellow Gryffindors, Hufflepuffs, and Ravenclaws, who wanted to see the downfall of Slytherin as the House Points winner. The four of them serve their detention the following evening with Hagrid in the Forbidden Forest where they need to find a injured unicorn. Splitting up, Draco, Fangs, and Harry cross the path of the downed unicorn and watch as a hooded figure comes and drinks its blood, which sets Harry's scar bursting with pain. Draco and Fangs flee and Harry is rescued by a centaur, Firenze, who tells him it is a monsterous thing to slay a unicorn, let alone drink its blood. Harry realizes that unicorn blood is like Elixir of Life, and that Voldemort is still around. Harry, along with Hermione and Ron, confront Hagrid about the stranger with the dragon egg, remembering Hagrid has always wanted one. Harry asks if Fluffy was ever brought into the conversation. Finding out that Hagrid gave away how to get past Fluffy, they believe the theft of the Stone is imminent. That night, Harry, Ron and Hermione go through the trapdoor to get to it first, but not without dueling Neville, who refuses to let them leave the dormitory. They negotiate the security system set up by the school's staff, and Harry makes it to the inner chamber. There Harry finds that Professor Quirrell, a stuttering and seemingly meek person, not Snape, is attempting to steal the Stone, and realises that Snape was trying to protect him from harm all along. Harry confronts Quirrell and survives a second encounter with Lord Voldemort, who has been possessing Quirrell (notably appearing as a ghastly face on the back of Quirrell's head). Quirrell is prevented from killing Harry or seizing the stone, his skin being painfully blistered when it touches Harry's bare skin; the struggle between Harry and Quirrell continues long enough for Harry to be rescued, although he almost dies when Quirrell is pulled away from him. Voldemort then pitilessly abandons Quirrell, who dies as a result of his possession. During Harry's recovery, Dumbledore - Harry's rescuer - reveals to him that Harry's mother died to protect Harry. Her sacrifice of pure love provided Harry an ancient magical protection from Voldemort's lethal spells. Dumbledore also reveals that the Stone had been destroyed to prevent future attempts by Voldemort to steal it. Dumbledore says that Flamel and his wife, Perenelle Flamel, (at least 665 and 658 years old respectively) have enough elixir to set their affairs in order and then they will die. At the end-of-year feast, the House Points totals are given: Gryffindor with 312 points, Hufflepuff with 372 points, Ravenclaw with 412 points, and Slytherin with 472 points. However, Dumbledore gives a few "last-minute additions", with 50 points to Ron for being a good chess player; 50 points to Hermione for being a logic whiz; 60 points to Harry for being very brave; and 10 points to Neville for standing up not just to his enemies but to friends as well. This gives Gryffindor 482 points and the title of House champion. Harry, Ron, Hermione, and Neville are instantly loved by the students once more.